Ear, nose, and throat issues happen during all times of the year, but we do see some problems pop up more in the winter. This is because the temperatures get colder and the air gets drier. So as we transition out of daylight savings and prepare for the long winter months, take a look at this list of the top ENT issues that could arise. Be ready to make an appointment to Palm Beach Sinus Doctors when early signs appear. Sometimes, an early diagnosis can help shorten the duration of the problem! Sure, it is “common” but that doesn’t mean it isn’t a pain to deal with. It can keep you out of work and keep you from enjoying the festivities of winter. Some of the symptoms include a runny nose, sore throat, coughing, congestion, and headaches. 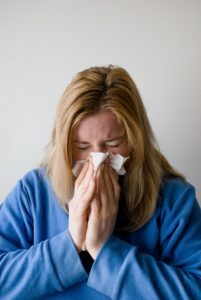 The common cold is a virus so don’t expect to receive an antibiotic for treatment (those are just for bacterial infections), but there are things we can do to help. If you don’t see improvement with your cold between 7-10 days, contact our office. The symptoms for the flu might sometimes feel like a cold and it can be hard to tell the difference. But the flu comes with a high fever. You might still have the coughing, sore throat, headaches, etc…but the fever tends to set it apart from a cold. The flu virus also can’t be treated with antibiotics, but we do have antiviral prescriptions that can help make the course of your flu shorter. And when you’re feeling bad, every day counts. Pneumonia is like a cold but with a stronger cough and a fever. A cold can actually turn into pneumonia, even though pneumonia is bacterial. The viral cold infection makes the perfect environment for bacteria to come in and take up residence. It’s a one two whammy. Fortunately, a antibiotic can help you feel back to normal. In some cases, you might need to visit the hospital if your infection is especially bad. When you come in with a sore throat, one of the first things we want to rule out is a streptococci bacterial infection or strep throat. This is another illness that mimics flus and colds, so it’s important to see your ENT to get the correct diagnosis. While it never feels good to have strep, antibiotics will kill the bacteria and get you back to your normal routine.